Enjoy sweeping city views, admire grand colonial architecture, relax on grassy lawns and spot free-roaming deer at Merdeka Square (Lapangan Merdeka). Measuring about 185 acres (75 hectares) inclusive of its gardens, it is one of the biggest squares on the planet. Merdeka Square was created in the 18th century as the Dutch East India Company’s Koningsplein (King’s Square). It was renamed after Indonesia declared its independence from Dutch rule. Merdeka is the Indonesian word for independence. Rising above the square is the 433-foot (132-meter) tall National Monument (Monumen Nasional), also known as Monas. Sukarno, Indonesia’s first president, gifted it to the nation as a symbol of independence. It features an obelisk crowned by a gilded sculpture of flames. Ride the elevator to the observation deck and marvel at the uninterrupted panoramas. On the ground floor is a museum exhibit with dioramas that portray Indonesian history from the prehistoric era to the battle for independence. Stroll around the tree-shaded lawns, where groups of friends and families play games, enjoy picnics, fly kites and take shelter from the hot sun. Browse the collection of sculptures, including a bust of poet Chairil Anwar and an equestrian statue of the Javanese prince Diponegoro. Watch a musical fountain show, which takes place on weekends. Spotted deer live in an enclosure in the southeastern corner. Inspect the colonial landmarks that frame the square. Among these are Jakarta City Hall and Merdeka Palace. At the National Museum of Indonesia, learn about the indigenous cultures native to the country’s many islands. Located at the heart of Central Jakarta, the square is easily accessible via public buses. Gambir train station stands on the square’s eastern edge. Walk here from other major city attractions such as Immanuel Church, Istiqlal Mosque and Jakarta Cathedral. Merdeka Square is busy 7 days a week and often hosts artisan markets and military parades. The National Monument is open daily and has an admission fee. Arrive early in the morning to avoid lines. The National Museum of Indonesia is open from Tuesday to Sunday. Located in the heart of Jakarta, this luxury hotel is within 1 mi (2 km) of Plaza Indonesia and Grand Indonesia Shopping Mall. Istiqlal Mosque is 2.4 mi (3.9 km) away. Jakarta Sudirman Station is 14 minutes by foot and BNI City Station is 20 minutes. This family-friendly Jakarta hotel is located in the business district, within a 5-minute walk of Pasar Baru and Indonesian Ministry of Foreign Affairs. National Monument and Istiqlal Mosque are also within 1 mile (2 km). Jakarta Gambir Station is 14 minutes by foot and Pasar Senen Station is 20 minutes. 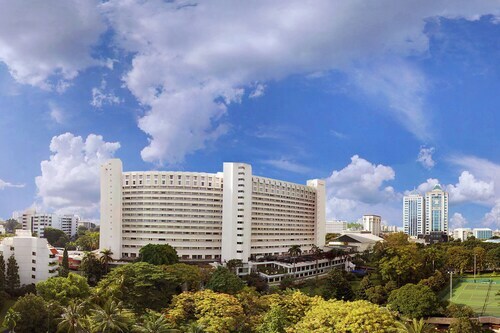 Located in the heart of Jakarta, this hotel is within a 10-minute walk of Sarinah Mall and Plaza Indonesia. Grand Indonesia Shopping Mall and Thamrin City Shopping Mall are also within 1 mile (2 km). Jakarta Gondangdia Station is 19 minutes by foot and Jakarta Sudirman Station is 20 minutes. 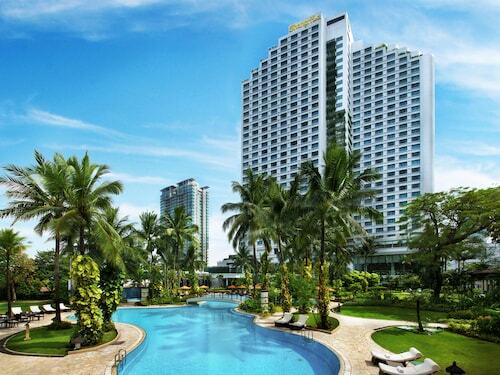 Situated on the Strip, this luxury hotel is within 1 mile (2 km) of Neo SOHO, Central Park and Taman Anggrek Mall. Thamrin City Shopping Mall is 3.1 mi (4.9 km) away. Jakarta Grogol Station is 24 minutes by foot. Situated in the business district, this hotel is within 1 mi (2 km) of Sarinah Mall, Plaza Indonesia and Grand Indonesia Shopping Mall. National Monument and Tanah Abang Market are also within 1 mi (2 km). Jakarta Gondangdia Station is 10 minutes by foot and Jakarta Gambir Station is 24 minutes. 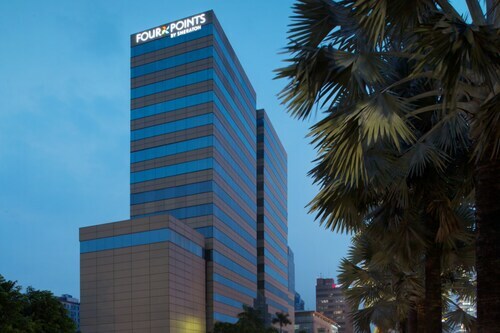 Located in the heart of Jakarta, this luxury hotel is steps from Bundaran Hi and Plaza Indonesia. Grand Indonesia Shopping Mall and Sarinah Mall are also within 10 minutes. Jakarta Sudirman Station is 13 minutes by foot and BNI City Station is 16 minutes. 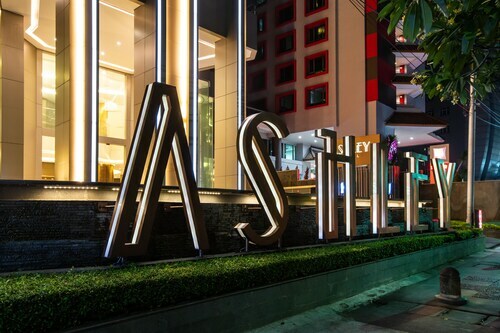 This family-friendly Jakarta hotel is located in the business district, within 1 mi (2 km) of Golden Triangle, Thamrin City Shopping Mall and Grand Indonesia Shopping Mall. Plaza Indonesia and Sarinah Mall are also within 2 miles (3 km). Jakarta Karet Station is 7 minutes by foot and Stasiun MRT - Setiabudi is 21 minutes. Located in the heart of Jakarta, this hotel is within 1 mi (2 km) of National Museum of Indonesia, Tanah Abang Market and Sarinah Mall. National Monument and Merdeka Palace are also within 1 mi (2 km). Jakarta Tanah Abang Station is 20 minutes by foot and Jakarta Gondangdia Station is 27 minutes.